THE AUSTRALIAN AND NEW ZEALAND STEEL MANUFACTURING BUSINESSES GROUP INCLUDES BLUESCOPE STEEL’S MAJOR FACILITIES AT PORT KEMBLA, SPRINGHILL, AND WESTERN PORT, AS WELL AS THE PAINT LINES AT PORT KEMBLA, WESTERN SYDNEY AND ACACIA RIDGE AND THE NEW ZEALAND STEEL BUSINESS. The 2007/08 financial year was a strong one for our steelmaking and steel coating businesses in Australia. In operations, Port Kembla Steelworks once again demonstrated its world class capabilities with very high production levels. Port Kembla slab production was the second highest ever, and only slightly short of the record set the previous year. This was achieved despite the upcoming reline of blast furnace No 5. This blast furnace, which turns raw material into iron for steelmaking, continued to perform well throughout the year. In a successful 18-year campaign, it has produced 42 million tonnes of iron. The hot strip mill and the plate mill at Port Kembla both achieved record production levels, due to increased plant up time and increased rolling rates. These high levels of performance and constant improvements are a result of the hard work and initiative of our people. In the current market, when prices and demand are both high, the success of this type of business is measured by its ability to elevate and maintain production levels. Our metal coating and paint line business recorded very strong performance. Total production from our three metal coating lines at Western Port was at record levels and the paint line at Acacia Ridge also achieved record production. Our new Western Sydney paint line is ramping up, and moved to a three shift operation during the year. It is now operating at around 70 per cent of capacity and continues to grow. This operation achieved an excellent delivery performance of 99.4 per cent during the year. A highlight of the year was the successful negotiation of five enterprise bargaining agreements in the Illawarra, and one in New Zealand, without lost time. The agreements place these operations on a solid industrial footing for the coming three years. During the year, there was a fatality at Port Kembla Steelworks. Despite enormous efforts to instill a culture of safety, a cleaning contractor was fatally injured while working on site. This is a tragic reminder of why safety is our number one priority. A tremendous amount of work has been put into safety at Port Kembla Steelworks, and much has been achieved. However, we must continue to strive for our goal of Zero Harm. 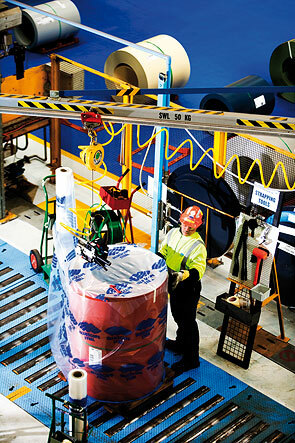 Above: COLORBOND® steel is prepared for despatch at our Western Sydney Service Centre. The facility has been recognised with awards for excellence in business practice and sustainability. Top: Salmon Tales, Rakaia, New Zealand. The architect’s vision of a steel fish was brought to life with the use of ZINCALUME® steel at this Restaurant and Visitors’ Centre. The aerial aspect demonstrates the expressiveness of steel in architecture. In 2007/08, we further improved our environmental performance, reducing our footprint in areas such as emissions and water. Fresh water use at Port Kembla Steelworks continues to decrease. We have passed a milestone in water conservation, with 10 billion litres of fresh water saved by the use of recycled water throughout the plant. The co-generation project is also progressing well. This project using surplus process gas from iron and steelmaking to produce electricity and steam has the potential to offset greenhouse gas emissions by over 800,000 tonnes per year, equivalent to removing 185,000 cars from the road for a year. At a cost of around $1 billion the co-generation plant will be one of Australia’s largest greenhouse gas reduction projects. We expect to conclude the feasibility study by the end of the 2008 calendar year. However, approval of this project will depend on a supportive regulatory arrangement. At our Western Sydney plant, new Regenerative Thermal Oxidizing (RTO) technology is reducing energy consumption and greenhouse gas emissions by reusing heat from drying and baking processes to pre-heat ovens and heat water. Neighbouring developers are considering tapping into this source for electricity generation applications in their businesses. In conjunction with the reline, we are undertaking a $135 million dollar upgrade of the sinter plant. The upgraded plant will deliver significant savings in raw material costs through its capability to process additional iron ore fines and displace more costly pellet feed. New Zealand Steel delivered a good performance. Domestic market conditions were strong, with robust sales into the dairy, non-residential building, manufacturing and distribution sectors. The residential market remained weak. Export demand for our products was high throughout the year. Overall production was solid, in line with the previous year, with records in heavy and light plate production. Slab production was good, reflecting improved ironmaking and slab casting operations. The kiln accretion issues were overcome through improved beneficiation at the mine site. A raft of process improvement initiatives continued. We have now completed the feasibility study for the vanadium extraction project, which involves capturing additional value from our ironsands resource. Approval of this project depends on a satisfactory emissions trading scheme. TKKM O Te Ara Hou Maori School, Napier, New Zealand. Dedicated to the teaching of Maori language and culture, this circular structure contrasts our steel building products with stone and timber to create a communal, welcoming environment. The major challenge for the coming year is the No 5 blast furnace reline. Raw material prices climbed again this year, placing significant cost pressures on the business. Higher steel prices are currently allowing us to absorb higher raw material costs. To ensure ongoing investment, our steelmaking businesses in Australia and New Zealand need certainty regarding carbon emission regulations. In a time of high steel demand, the best response is maintaining and improving productivity. The men and women of this business have responded extremely well to this challenge, maximising production and continually setting records. This is a major reason why our Company has performed well in recent years. Demand for our steel products has been strong. To fully capitalise on this situation, we needed to operate as efficiently as possible. The men and women of these businesses responded extremely well to this challenge, maximising productiON and taking full advantage of market conditions. Above: University of Western Sydney. 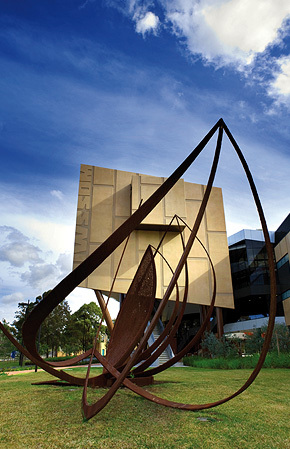 ’Amity’, by sculptors Bruce, Benita and Lee Tunks, uses XLERPLATE® steel to create the elegant lines of a lotus flower. Artists are increasingly choosing steel for its aesthetic qualities, as well as its structural properties. Above Right: Ian Thorpe Aquatic Centre, Sydney. 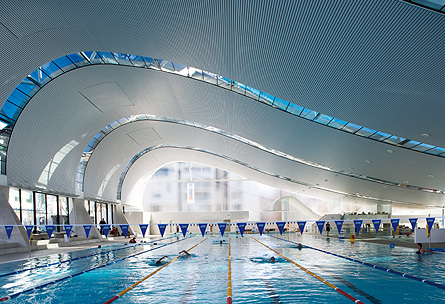 This striking wave-like building, one of the last projects from renowned architect Harry Seidler, highlights the design flexibility of our steel building products. The Australian Coated and Industrial Markets business is responsible for sales and marketing and supply chain management of the uncoated and coated product range to customers in both our Australian domestic and International markets. The Australian Coated and Industrial Markets business was established in November 2007 as part of a major restructure aimed at sharpening customer focus within our Australian and international markets. Following the direction set by the BlueScope Blueprint, we have developed a strategic plan for the business and have identified opportunities that will deliver efficiencies intended to improve the way we do business. We are focusing our efforts on improving our integrated supply chain aimed at fully aligning the demand and supply sides of our business. The 2007/08 year has seen extremely high global demand for steel driven by strong economic activity in major steel consuming nations around the world. This resulted in a supply/demand imbalance which has impacted the markets in which BlueScope Steel competes. The Australian domestic market has been particularly buoyant and a key focus throughout the year has been producing at full capacity and maximising supply to our customers in Australia. In the fluctuating business environment, our ability to supply customers was tested with forward buying creating additional demand. These conditions emphasised the need for supply chain and inventory level flexibility. Strong building activity levels and market share recovery in unpainted products underpinned record sales volume and revenue to our direct building sector customers. Sales volumes grew from the previous year to new levels. During the year, record sales were achieved for the pre-eminent COLORBOND® steel brand, while new products like TRUECORE® steel framing continued to grow. Sales of GALVASPAN® and ZINCALUME® steels to the building sector also improved, due partly to lower imports, despite the stronger Australian dollar and higher interest rates. In the domestic industrial sector, our XLERPLATE® steel sales increased, driven by strong demand from the key mining, wind tower construction, port infrastructure and water market segments. Sales to coated distribution customers and the pipe and tube market grew moderately whilst sales to other markets, such as the manufacturing and automotive sectors, were consistent with the previous year. A key area of focus will be to continue to establish the sustainability credentials of our steel productS. In 2007/08, our international markets saw record prices for hot rolled coil and steel slab, due to factors such as strong global demand for steel, record raw material price increases and record high freight rates. There is much to achieve in the coming period. In particular, we are committed to ensuring high levels of service to our customers and markets during the reline of the No 5 blast furnace at Port Kembla Steelworks. We see opportunities to build on our strong customer relationships and increase market penetration in selected market sectors. In particular, we will focus on significant opportunities to develop innovative products and services for our customers. Another key area of focus will be to continue to establish the sustainability credentials of our steel products by completing Life Cycle Assessments on our products. In addition, we are reviewing the potential impact of the Carbon Pollution Reduction Scheme on our products as it relates to our customers and markets. We look forward to communicating our position to our key stakeholders. In what has been a challenging year, the commitment and contribution from our employees has been significant. Working together we will continue to develop and engage our people as a critical element of delivering on our plans.